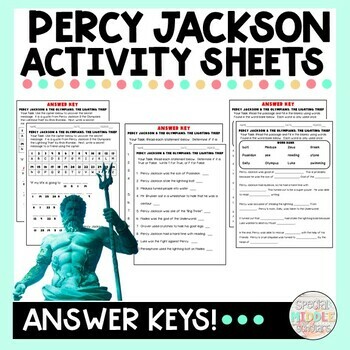 If you are studying Ancient Greece, Greek Mythology, or reading the Percy Jackson series, then consider showing the movie to your students! Your students will be able to see characters that portray different Greek gods, and mythological creatures- and the action will be sure capture their attention! 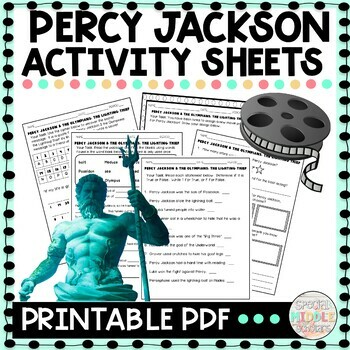 I created these fun worksheets to target different skills. Students use context clues to fill in the blanks using words from the word bank. Students problem solve by using a cipher to decode a secrete message (a quote from the book). Students can then write a secret message to a friend. Alternatively, you can give students a word, phrase or quote to write in code using the cipher. Students express their opinions about the movie, and then improve the film by creating their dream cast and soundtrack. Students enjoy incorporating their interests! Suggestion: Have students share their dream cast/soundtracks with the class to practice the social skills of listening, waiting their turns, disagreeing appropriately, and speaking in front of the class! Students practice being persuasive by designing a movie poster to promote the film. This would be a great opportunity to discuss advertisements, and for students to show their creativity. Suggestion: Use this worksheet as a rough draft, and allow students to draw their final posters on a large sheet of paper! Consider putting students in groups for this project.